Springtime feeding finds me opening gates. Lots of gates. And closing them again. This was the first gate I opened this morning so a bale could get hauled in for some new pairs. The gates are getting more female friendly all the time, but there used to be several gates around the ranch that were definitely built for tall men to open and NOT for a short-legged and short-armed woman. Getting the gate open is one thing– closing the dreaded thing is a different story. I’m a strong woman and a challenging gate that you have fought with for 5-10 minutes can bring forth anger, frustration, praying, cursing, laughing… you name it. Work at closing a gate long enough and you eventually run the gamut of emotions. Then you are praying that you have a rope with you somewhere to help get it closed. 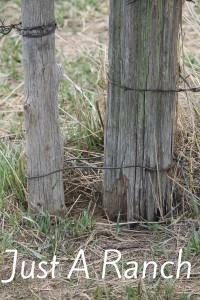 There used to be gates on this ranch that when I couldn’t wrap my around the gate post and reach the fence post to pull them together to shut the gate. How the heck is a girl supposed to close a gate when her arm is too short to reach from one post to the other. Dang tall men! This picture is the same gate as above, just heading back out it, closing it, and heading to the next one. Gathering cows to feed and found this calf in the tree rows. You can’t see it here, but after crawling through the fence, pulling a glove off on a barb while trying to reach over my head and unhook my hoodie hood from the wire above me, ripping my pants, I ended up chasing this calf down to the other end of the tree rows to find the gate I ended up opening down there. Did he find it? Heck no– he crawled through the wires at the other end. Oh well– he is back with his momma and happy. Below are the cow/calf pairs on one side of the pasture spread out enjoying the green grass. I gathered all these pairs and took them over to where the hay was being rolled out for them this morning. Did I mention the wind is blowing 40 mph and it is pretty dang chilly! However, it is NOT 30 below wind chill with snow blasting my face so enjoyed the morning nonetheless regardless of the wind! The calves were tucked behind the rocks everywhere staying out of the wind. So after getting everything in the second pasture gathered for feed, I then start walking through everything. I look for sick calves, hungry calves, or anything else that is out of sorts. Here is the video showing the second group on hay and over the wind you might hear me saying the above. Then on to the next pasture where the 2-year-old heifers and their calves are located. I am now set to open gate #5. You can see the tractor coming past the other side of the hay corral to come around to the side where I was. Crazy enough– this is only gate #5 for me to open this morning as I missed the first gate this morning. They fed the drop bunch and opened their own gate while I was getting the Wild Child ready to go to Granny’s. She opted out of being my right-hand-‘man’ this morning. Can’t imagine why! So, back to gate #5 below. Bales loaded, gate closed, and heading down to gate #6 to feed the heifers and their calves. Just a little FYI for the morning– For all you readers that regularly open a gate, you can attest to the fact that the bottom wire that you slide up around the gate post is very important in trying to close a tough gate. For those that haven’t had the pleasure of opening a wire gate like this, the higher you can get that bottom wire slid up the gate post (the left post in this particular picture — the right post in this picture is set in the ground) the easier it is to close the gate. It is a learned art to successfully use your foot to slide that wire up while holding the gate post and trying to close the gate. Hope you enjoyed riding along on my morning trek. It was a little lonesome, and quiet, without the Wild Child. The wind made up for it, though. No doubt about it– I live in the land of infinite variety, and I love it. This entry was posted in Uncategorized on April 30, 2013 by Ranch Wife. In celebration of our anniversary yesterday, I thought I would tell you about our awesome wedding. Now don’t just roll your eyes and click to a different screen. This was NOT your normal wedding. Becoming an “official” ranch wife was really quite fun. The Big Guy and I were both part of very unsuccessful relationships the first time around, although both lucky in that those relationships blessed us with children. Hence the his and mine that I refer to often in my posts. I never would have guessed that I would fall in love with this man. Nor, would I have ever guessed that I would have another child. I was done. Done with men, definitely done having more kids, and just ready to face the world on my own as a single mother. I have known the big guy for most of my life. We were both raised in the same community. We didn’t actually go to school together as he is MUCH older (small joke) and instead went to high school with my older brothers and sisters. I would add more about this but it would just highlight our hillbilly tendencies and I probably don’t need to go there and over-share. Interest piqued? But I digress– back to the wedding. We “lived in sin” for several years before taking the time to actually tie the knot. (Sorry moms). We finally got engaged around Christmas time, which made our girls so excited. The big girls were excited that they were really going to be sisters, and the Wild Child was excited that “me and Bossy, and mom and dad are getting married.” For those who know us, you already know who Bossy is. For those that don’t know us, Bossy is the Wild Child’s stuffed cow that she got when she was a week old. We start ’em young around here loving cows! The big girls wanted a HUGE wedding, a HUGE party, etc. Teenage girls and socializing go together like salt and pepper, PB&J, rain and green grass, sugar and cream… they go hand-in-hand. We didn’t want a big wedding. We were good with a party, but not a big wedding. The girls argued that just our family would mean a big wedding so we might as well go ahead and really throw a huge one. We objected. They argued that wouldn’t our friends be upset that we didn’t have a big wedding for them to attend? We countered that our friends would be tickled absolutely pink if they didn’t have to sit through a wedding. The sparring continued. We won– in a way. The Big Guy’s birthday is at the end of spring, the end of calving, the end of snow (usually), and always a great time to just chill and have a few cold ones. We decided that I would throw him a surprise birthday party and instead turn it into a surprise wedding. We didn’t want anyone to feel obligated to attend our wedding. We didn’t want people to feel like they needed to give us gifts as their presence and prayers for a happy future were the best presents we could get. We figured that anyone that was important to us, and was able to get there and without prior commitments, would show up at the birthday party. It was so fun. The girls thought we were having a surprise party. They spread the word. I spread the word. My family spread the word. My friends spread the word. Everyone was invited to the Big Guy’s SURPRISE birthday party. It was extremely entertaining to watch people try to talk around it when the Big Guy was around. People are just naturally VERY BAD at keeping a secret. I can’t begin to count the times people would say “I can’t wait until the 28th!” And the Big Guy would say “Really? What’s happening then?” Then we would get to watch people stumble and fumble and completely totally, and be honest, horribly lie about what was happening. They would then call later and apologize for almost ruining the surprise. We would just laugh and laugh. The planning continued. We decided that we would baptize the Wild Child previous to the wedding, tell everyone at the baptism’s end that they were there also for a wedding, and then walk across to the bar where everyone was waiting to “SURPRISE” the Big Guy to let them in on the true surprise. First we had to go shopping. We had to figure out a way to get the older girls (the maids of honor) to buy something to wear. We finally told them that we didn’t know when the wedding would be, but that we would probably just go to the courthouse to do it and that they wouldn’t have another chance to get a dress. The debates began again, only now they wanted color choices (I told them bright colors), style choices (I told them whatever they would wear again), should they match (told them to wear what they liked and no didn’t need to match). It was one thing after another. I bought something to wear to the baptism. Black. Oh my goodness. I couldn’t possibly wear black to anything– not a baptism and definitely not a wedding. It wasn’t a dress. GOD forbid! Now this definitely couldn’t be for a wedding!! Did I mention that teenage girls are style princesses and up on all things wedding related? We made it through the shopping. Crazy enough, the girls bought matching dresses, but just with different colored accessories. I ended up having to enlist the assistance of one of my sisters. I was getting in over my head. I needed to figure out a way to get the girls to wear these dresses to the baptism, and I needed help to decorate at least an altar and a couple of tables– nothing fancy, just quick and easy. My sister took care of the girls. She convinced them that she was surprising us with a trip to Hawaii for all of us to go down there and get married. Hawaii?? They bought it, and we laughed. Poor girls. They were going to be so sad to know we weren’t going to Hawaii. The decorating ended up being real quick as there was a baby shower first so by the time they got done using the hall and we got all the visitors kicked out, we had about an hour to decorate before racing home where we had an hour to get ready for the wedding. It was a little rushed. And fun. Thankfully my sister had brought her sister-in-law (and one of my good friends) along and the three of us just flew through things. It was simple, easy, and completely us. Another item checked off. We raced home to get ready. The older girls had a little meltdown to my sister about me wearing my future wedding outfit to the baptism. They convinced her that she needed to come upstairs and talk me into wearing something else. I couldn’t wear it to the baptism and then wear it again later for the wedding. That was just wrong. Remember– they ARE fashion mavens. My sister told them she tried to convince me, but to no avail. Didn’t they know how stubborn I was? They did. We laughed. Off we went to the Wild Child’s baptism–them in their wedding dresses thinking it was okay to wear them as they were going to Hawaii soon and would need something else to wear anyway, and me in my wedding outfit (black) getting scorned at for my fashion faux pas. Everything fell in place perfectly. The Wild Child’s godfather was one of the men my Big Guy wanted for his best man, and of course the other friend that he wanted wasn’t going to miss either the Wild Child’s baptism or the Big Guy’s surprise birthday party so they were both available. The baptism was beautiful. We then announced to everyone there that they were actually there for a wedding, too. The looks were priceless. We just asked our guests to have a little patience as we had to run to the bar where everyone was waiting to yell surprise and let them in on the real plans. The girls were not happy when they realized they weren’t going to Hawaii. Can you see it on their faces? They still don’t think it is funny. Especially when the jokers ask them how their trip to Hawaii was. We walked over to the bar to spring our own surprise on our birthday party guests. Our friends yelled “SURPRISE” to the big guy when he walked through the door. He just laughed and said “Well, really the surprise is on you. You aren’t here for a birthday party; you are actually here for a wedding!” We then invited then to either come to the wedding or just wait for us and we would be back to dance the night away and visit. Again– the looks were priceless. Great memories. It was an awesome night. We were surrounded by friends and family. There were some missing that had prior commitments and didn’t make it. We laughed at the calls we received afterwards with people telling us they KNEW that something else must be up, and dang it why didn’t they make it. We replied the same way to all– “Yeah Right!” but everyone was right where they needed to be– whether they made it to the wedding or not. Oh yeah– and the second best part of our wedding?!?! It rained over an inch that night! We were sure that was GOD’s blessing on our marriage. What ranch wife wouldn’t think that? This entry was posted in Uncategorized on April 29, 2013 by Ranch Wife. I love that I can pray absolutely anywhere, and as a ranch wife feel so close to GOD all during my day. I am constantly surrounded by his beauty and witness to his miracles. It also amazes me the amount of prayer warriors that touch our lives on a daily basis. This was never more evident then this week. Our friends found out their month-old baby was born with two holes in her heart. I can’t imagine how scary and devastating that news was to hear. I know how scary I was. I cried my heart out for them. And while I cried I prayed. I wasn’t there to hug them or comfort them, so I did what would help them the most— I prayed. I prayed for strength for the sweet child, strength for the parents, healing, and comfort for all as they navigated the terrifying, uncharted waters that lie ahead. The great news continued. The doctor was able to successfully repair the two holes in the heart. The sweet little angel is now recovering from the surgery, already in a regular bed and out of a pediatric intensive care unit (PICU) bed, and plans are being made for discharge home in a few days. Now along with the prayers of healing being sent up there were also prayers of thanksgiving. We thanked the LORD for the steady hands of the physician. We thanked the LORD for his healing touch on this child. We thanked the LORD for bringing together such a group of prayer warriors and for hearing the pleas. And the praying continues by every single warrior. I have no idea what GOD’s plan for this child might be, but this little punkin has already touched an incomprehensible number of hearts. This child made us all stop and reevaluate things. Was the calf running through the fence really that big of an issue? Shouldn’t we be thankful for the moisture we have received instead of continuing to complain about it not being enough? Maybe I should be hugging these teenagers instead of complaining about them not putting their clothes away! For a few days we have all focused our thoughts and prayers on this child. For a few days we have stopped worrying about the things we cannot change, and dealing with the little things without complaint. For a few days we have focused on helping someone else and giving thanks. We prayed, every single warrior. This entry was posted in Uncategorized on April 28, 2013 by Ranch Wife. **Why is there no one home to eat supper on the nights when you actually make a well-balanced tremendous supper? **Why can teenage girls get up at the crack of dawn for a social event and/or at the urging of their friends, but can’t hardly drag themselves out of bed before noon if they are home with work to be done? **Why does the stinkin little pup insist on dragging every blanket out of his dog house at least three times a day? **Why does NO ONE except a mom seem to know how to refill the toilet paper stash beside the toilet? **Why does it seem like the last 15-30 cows take absolutely forever to have their calves? **Why are you absolutely certain when you are at the grocery store that you have everything else you need for your recipe at home only to find out that you don’t when you start to make it? **What makes mud so fun to play in? Plus, I don’t think the broom is going to make a difference in cleaning you up this time, sweets! **Where do those MONSTER flies hide all winter while waiting to show up in your house on the first nice spring day?? This entry was posted in Uncategorized on April 27, 2013 by Ranch Wife. Awwww! Finally Friday! Glorious Friday. The day I get to just talk about my blessings. They are many. **Grilling season! YAY! Plus a full freezer full of beef! How can I not be thankful for this! **Mellowing enough to let my 4-year-old decorate her own birthday cake and not be worried about how it looks. It’s a dalmatian puppy. Can’t ya tell?? **Washing supper dishes and getting to watch this fabulous moon come up! **My awesome husband who took the day off to just be there for me when I had to go to an appointment I was nervous about. And please don’t tell him I got all mushy on here; it might freak him out a little! **Just being in the moment enough to recognize and appreciate the little things that make beauty around me. **The big guy showing up in time to help me find the missing float in the tank before I had to go swimming. **My Wild Child getting a much-needed nap among her animals because even tough cowgirls get tired. This entry was posted in Uncategorized on April 26, 2013 by Ranch Wife. It makes me absolutely crazy to see how much trash is lining the ditches in our community. The increase in traffic to the North Dakota oil fields has exponentially increased the amount of trash in our ditches. I know these people are stopping for gas/snacks/drinks, etc., along with way. Why can’t they throw their trash in a garbage can? It makes my heart sad when you hear a clink or plastic sound when you stab your pitchfork into a bale while pitching up hay for the horses. Then we find a pop bottle, chip wrapper, gut bomb wrapper, or something of the sort stuck inside the bale of hay. It makes my heart sad to see all the trash in the hay rolled out in the pasture to feed the cows and calves. It makes my heart sad and my temper burn to walk through the pairs on the feed ground and pick up garbage all during the walk. How has it happened that we have lost all our pride and our respect, and it is somehow okay to throw all your trash out the window. This picture above is all the trash that I picked up out of ONE round bale two days ago. This was just the trash that was right on top. Who knows how much more there might have been buried in the hay. There were two 16-ounce plastic pop bottles, two aluminum cans, a big plastic cup from a convenience store, and a black plastic gallon oil jug. Unbelievable. My bout with littering was short-lived. I was a preteen, fun-loving, cocky, and believed I was much smarter than most around me. While traveling down the highway with my brother and sister-in-law I finished a soda and opened the window to throw my can out in the ditch. My brother informed me, “If you throw that can out you will be running back to pick it up.” I just laughed and pitched the can out the window. He drove at least another mile (just kidding– he probably stopped at the next approach), stopped the vehicle, and said “Go back and pick up your can. We don’t litter.” I laughed as surely he had to be kidding. He wasn’t. That lesson is a lesson I have never forgotten, even though it was over 30 years ago. What a great lesson it was. I still don’t litter. I LOVE that I live in a sparsely populated area. I LOVE that everyone here loves the land and are such excellent stewards of the land. I LOVE that our school and community has a yearly clean-up day to help keep our local small town looking its best. I LOVE that our ditches used to be relatively trash-free. This has all changed. Many people traveling through our county are obviously pigs. We have found sacks of food wrappers and bottles lined up neatly on the shoulder of our road where it meets the highway. Seriously?? You took the time to line up the bottles in a neat, single-file line yet you can’t take the time to throw the trash away at the next gas station?? I can’t imagine the thought process that went into this decision. Obviously there wasn’t much thought involved. Please don’t litter. Please take care of your trash appropriately and don’t make someone else clean up after you. Please take pride in this wide open country you are driving through, enjoy the scenery, and have enough respect for the people living here (as well as respect in yourself) to not use our land and highway ditches as your personal trash can. Just a small request from this ranch wife. This entry was posted in Uncategorized on April 25, 2013 by Ranch Wife. Financial planning. A necessary evil. First off, I think we are insurance poor. Health insurance. Life insurance. Car insurance (with teenage drivers! EEK). Dental insurance. Crop insurance. Property insurance. Umbrella insurance. Liability insurance. Workers compensation insurance. Do you ever feel like I do and wonder how you can afford anything else with all the insurance costs? We do. My advice to all you youngsters out there– buy your life insurance as early as you can in life. Don’t wait until you are approaching 50 and decide you don’t have enough. Even if your health is great, the insurance company doesn’t think your age is too great! We are constantly in the throes of financial planning. We have re-done our wills, which prompted us to look again at our life insurance. Having mine, his, and ours creates its own set of challenges in every part of our life– especially in planning for the future. We have an adult child whom we don’t have to worry about as much as far as educating if something happens to us, but still want to make sure he is taken care of. On the flip side, we have a toddler who, if something happens to us, we have to worry about educating plus lots more. We have to decide who would take care of our Wild Child, feed her, clothe her, educate her. Plus, we need to make sure the funds are available to do all this and more. And, we have kids in between the old and the young, all with their own set of challenges. We try to cover all the bases when planning for each of their futures. Being ranchers we are faced with even more decisions. Are any of our kids going to want to come back and live this life? If so, or if not, how do we help them even while encouraging them to make their own way? We hope that they have not only physical strength, but strength of work ethic, strength of morals and beliefs, and strength to face adversity. They are going to need all these to make a living in agriculture, or a living in any other field, but especially agriculture. We constantly question if we have planned enough. We know that our plans will have to repeatedly be studied and amended, especially in this ever-changing world. Our hope is always that we have our ducks in a row, and that we continue to make good decisions in all this process. Another thing on this ranch wife’s prayer list! This entry was posted in Uncategorized on April 24, 2013 by Ranch Wife. My sisters made me do it! Being from a family of 10, six of us whom are women, I have used that excuse more than once. My poor mom! I’m sure she heard every excuse imaginable. How she put up with it I will never know. She didn’t spank us enough that’s for sure. But yes, this time my sisters really did make me do it. One of my older sisters convinced my baby sister and me (we are the two youngest girls) to think about blogging. I suppose she knew that we both had enough baggage to keep a blog going for years. I suppose she could be right. This might not make a lot of sense to any of you, but let me assure you, it made loads of sense to me. The start almost paralyzed me. The start made me break out in sweats. The start gave me goosebumps and caused me to lose sleep. Yes, the start almost stopped me. It is easy to put yourself out there to strangers. It is not so easy to bare your soul to your family and friends. It is almost as hard as starting over in a new relationship at the age of 36 after a 15-year relationship finally died a painful death. People know the basics, but they don’t know the nitty gritty guts of stuff. Same with writing a blog. My friends and family know the basics of what happens around here, but they don’t know the nitty gritty guts. I live in the same yard as my in-laws. They are fabulous and I couldn’t think of anyone I would rather live this close to, but they don’t know that I didn’t go to the barn for three days because I was in the house trying to prove a point to their son. They may have suspected, but they would never ask. They are the most non-intrusive people I know. How blessed we are to live in the same yard with them. Unfortunately, they don’t share the same luck as they have to live in the same yard as a crazy woman! The craziness is what is tough to share. It can be a circus around here. Thanks for letting me vent. I didn’t let the start stop me. I promise not to over-share as I know it would scare the jeepers out of you! But I do promise to try to give you a daily glimpse of what it is like here on this South Dakota ranch from a ranch wife’s perspective. Thanks for coming along for the ride. This entry was posted in Uncategorized on April 23, 2013 by Ranch Wife. The Big Guy’s gram was a good friend of mine. She was so full of wisdom. She and her husband lived in a time when everything was done manually. They used horses to cut the hay, they manually pitched the hay into haystacks, then pitched the hay into the feed wagon to feed the livestock, and then pitched it off again while feeding. No tractors– just pitchforks. She told about cooking three meals a day for 30+ men for months on end. She had no refrigerator. She had an ice box. She made her own bread, made her own butter, gathered her own eggs, planted and tended to a huge garden, did all the laundry (WITHOUT a washer and dryer) for her family and all the men, kept her house clean, kept the bunk house clean, kept track of her children, and the list goes on and on and on. That’s busy. My day comparably is NOT. So why is it she could tackle all of this, and successfully I might add, and I seem to struggle with a tenth of the workload. My biggest issue?? Time management. Oh– and laziness, but to make myself feel better I blame it all on time management. Gram told me if she made sure her bed was made and the dishes were done, then the rest would just fall into place. She told me that several times. I never really GOT it, UNTIL I became a ranch wife. I can now completely relate. Making my bed in the morning just starts my day out on the right foot. I have often made my bed over top of the still sleeping Wild Child who sometime during the night has found her way into our bed. She is really good at getting up without messing it up hardly at all. Then to make my morning even better, I so enjoy coming into a clean kitchen. Those two things– a made bed and a clean kitchen, really do make my house run much smoother. Yep Gram– it’s the little things. When I really realized I better learn some time management skills was while working full-time PLUS as a CFO at a hospital/nursing home while taking online classes to finish my degree. My online classes had posting requirements where I was required to take part in class discussions at least five days out of the week, and then our weekly assignments (one personal and one team assignment) were due on Sunday night at midnight. It took me several weeks, maybe months, before I stopped waiting until Sunday night at about 9:00 p.m. after my kids went to bed to start on my assignment that was due at midnight. Ugghhh! I would be so tired and so grumpy about sitting there doing homework. It took me awhile to admit to myself that the situation was entirely my fault. Admitting that was freeing. It then allowed me to step back and figure out what I needed to do differently. The first thing I did was to start doing some research on time management skills. At first this seemed very counterproductive as I was spending time doing this instead of time doing the other things that needed to be done. However, it was time well spent. The best piece of advice I found over and over was that everyone has the same 24-hours in their day, and how was I using mine. It took me quite some time to “get” this. It was how I was using, or NOT using my 24 hours that was the problem. I still have this problem sometimes, but at least now can put the blame where it rests– squarely on my shoulders. I now try to use my 24 hours much more productively. Am I always successful? Heck no! But at least now I know some tools to be more successful, and every little thing makes a difference in the day of this ranch wife. This entry was posted in Uncategorized on April 22, 2013 by Ranch Wife. The Big Guy is just that– a Big Guy at 6’3″. His father and one brother are even taller. His other brother is just a little shorter. My brothers, nephews, and brother-in-laws are all sizes, but one thing is standard. All these men are men with big hearts. I think they like to think that their goodness is hidden, but it is actually pretty transparent. Just ask the Wild Child. She LOVES her family of big-hearted men. She knows that they will saddle her horse, take her in the tractor, lead her around, and let her be part of just about all of their day. It was very apparent today when she thought one of her uncles pulled into the yard. She looked out the window, turned around smiling, and said “Mom! I think he came just to give me a birthday hug.” Yep– she has these big men pegged as real softies. It makes my heart smile every time I see one of these big men, or any man actually, show love and tenderness to kids, the elderly, women, and animals. Living in an agriculture community, and being a ranch wife, means that my heart is smiling often. The Bible states “A righteous man cares for the needs of his animal, but the kindest acts of the wicked are cruel.” (Proverbs 12:10). This is the nature of the rancher. The men I know never put their own needs above those of their animals. This is never more apparent than in the springtime. I love watching the big guy doctor a calf. He is always scratching the calf’s head and ears, and talking to him while I’m measuring medicine doses. Yep– he’s a big softy. I get to watch the men around here stop for the dogs on their way across the yard in the morning to give them a good belly rub. They complain about the cats on the back step, but are quick to give Bootsy (the old momma cat) some petting. We have an old horse, Stan, who turned 32 years old this spring. They might complain about Stan being a pain as he still tries to beat you to every open gate, but then in the next minute they are picking up all the alfalfa leaves off the ground and putting them in a bucket for him because they are easier for him to eat. Ranchers have spent many, many sleepless nights over the last several months. At our house we have checked the heifers and cows every two-to-three hours 24 hours/day since February 9th. Then all morning every morning during the winter and spring is spent feeding all the livestock, checking all the water, tagging calves, etc. There is always more to do during the rest of the day, and even more still that is waiting to be done– bottle-feeding those that might need a little extra, fixing fence, sewing up a prolapse, doctoring, feeding horses, trying to fix whatever needs fixed, repairing equipment, moving snow, cleaning corrals, sorting pairs, etc. But it is what we do. We care for what is ours– whether it be the land, the animals, our children, our parents, our friends, or our community. “Are not five sparrows sold for two pennies? Yet not one of them is forgotten in God’s sight.” Luke 12:6 No matter how big or little, or whether they are being sold for our income or just living out their life on the ranch because they are a member of the family, all are GOD’s creations. We love and care for each and every one. We sacrifice sleep, fun, meals, warm beds, and much more to keep all that is ours safe, healthy, and happy. 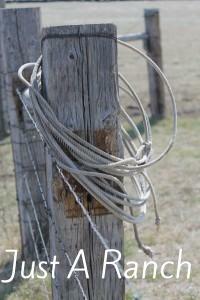 Such is the life of a ranch wife– and the rancher. We are blessed, and tired, but life is grand. This entry was posted in Uncategorized on April 21, 2013 by Ranch Wife.